We’re proud to be partnering up with L Magazine in presenting a night of music during the first Northside Festival, which will be taking place at music venues throughout the Williamsburg and Greenpoint neighborhoods of Brooklyn June 11-14. 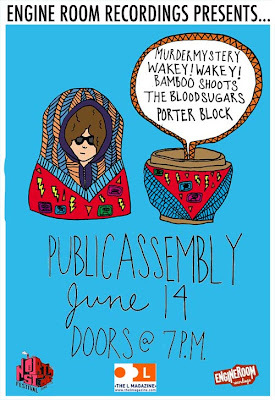 Our show is taking place Sunday night at Public Assembly, check out the flyer below designed by our very own Melissa Marchesano. Hope to see you there! This entry was posted on Tuesday, May 12th, 2009 at 7:43 am	and is filed under News. You can follow any responses to this entry through the RSS 2.0 feed. You can leave a response, or trackback from your own site.